The Offwell Woodland and Wildlife Trust has been restoring a 50 acre Forestry Commission site in East Devon. This south facing, steep sided wooded valley has now become the Woodland Education Centre. During the fieldwork season a class or group visits everyday. Human beings have had a considerable influence on the area (history). When work began in 1986 the site was overun with a vast jungle of sterile rhododendron. In many places the rhododendron was over three times the height of a person. 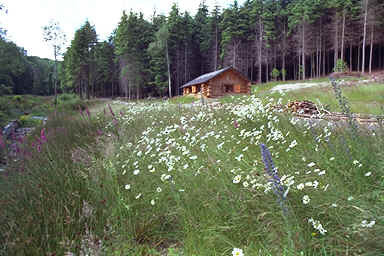 As a result native plants and the animals which rely on them had disappeared. 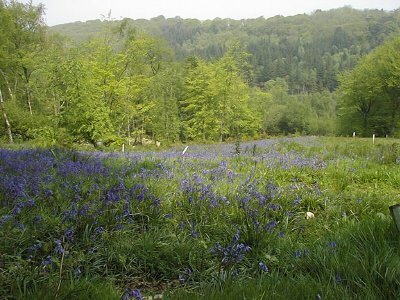 Now much of the woodland has been restored and supports woodland plants and animals such as badgers, deer, woodpeckers. Work funded by BT and English Nature has increased the habitat for dormice which are nationally endangered. A recently cleared area of woodland has been surveyed and monitored and the Woodland Restoration Project report is available. An area of heathland is being restored and a very comphrehensive report is available which features surveys, before and after pictures as well as statistical analysis. The Centre now has three ponds, a small lake as well as wetlands and marsh. As a result it is a major amphibian and dragonfly breeding site. Up to two thousand toads spawn in a good year as well as significant numbers of frogs. 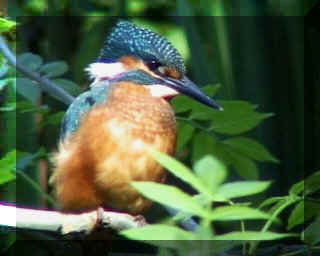 Other species which breed regularly include kingfishers. A report on the Wetland Restoration Project can be found here. The average annual rainfall in Offwell is 47", with a range of 35" - 65". (These figures are based on data collected over 35 years by Mr & Mrs Hall of Offwell).